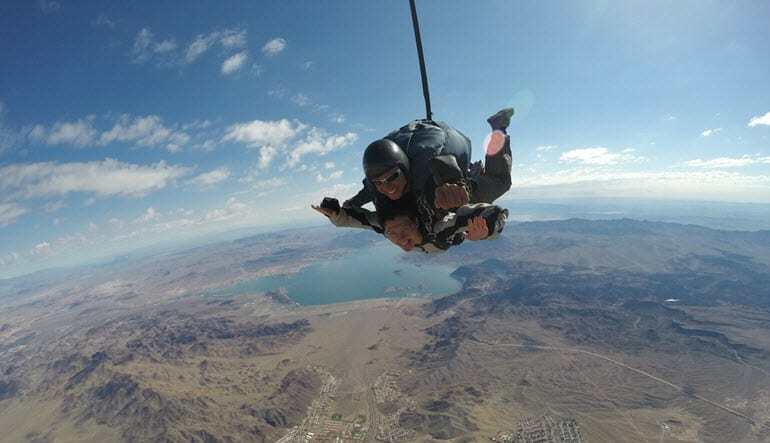 Your Las Vegas skydive adventure starts with a complimentary shuttle pick-up at your hotel (if needed), and then transports you to Boulder City Airport just 30 minutes away from the strip. Once you arrive at the dropzone you will go through ground training with your USPA certified tandem master where you will learn everything you need to know about safety and technique. You will have plenty of time to ask as many questions as you want to make sure you are totally comfortable when doing your tandem jump. You will be attached with a tandem master for the duration of the jump, so sit back enjoy the jump! 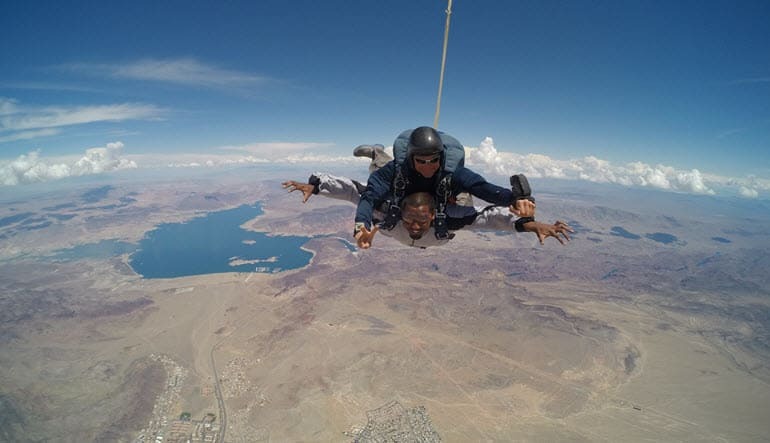 Views of Hoover Dam, Lake Mead, Valley of Fire and the Vegas Strip during your freefall! Nothing to pay on the day! You’ll reach the 12,500-foot mark in just 10 minutes! There, you and your certified tandem partner approach the hatch and face the awesomeness of Las Vegas' open air. Exposed to nothing but the vast, blue skies and views of Hoover Dam, Valley of Fire, Lake Mead, you take the plunge. Freefall for a hair-raising 45 seconds. What’s best, at 12,500 feet you get to experience the full thrill of the jump for a remarkably affordable rate. brilliant time, thank you. another tick on my bucket list. maybe some skydive fridge magnets available for purchase afterwards? Excellent time! Would highly recommend. Pick-up location is the McDonald's rear parking lot at 3999 Las Vegas Blvd at the intersection of Las Vegas Blvd and Four Seasons Dr.